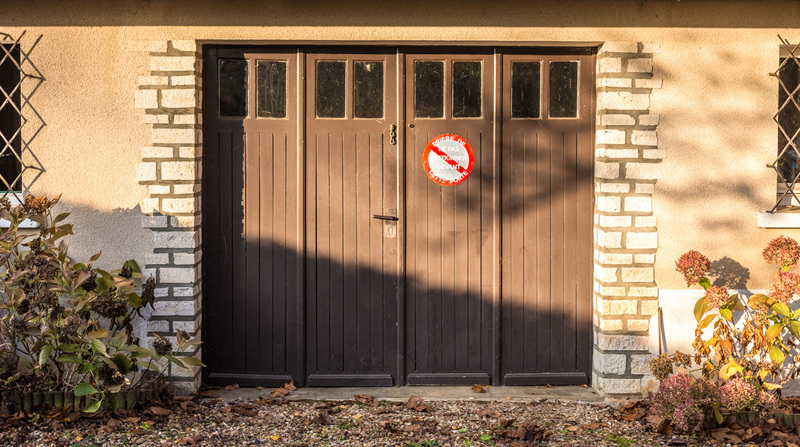 What is it about doors that makes them such a common subject for photographers? 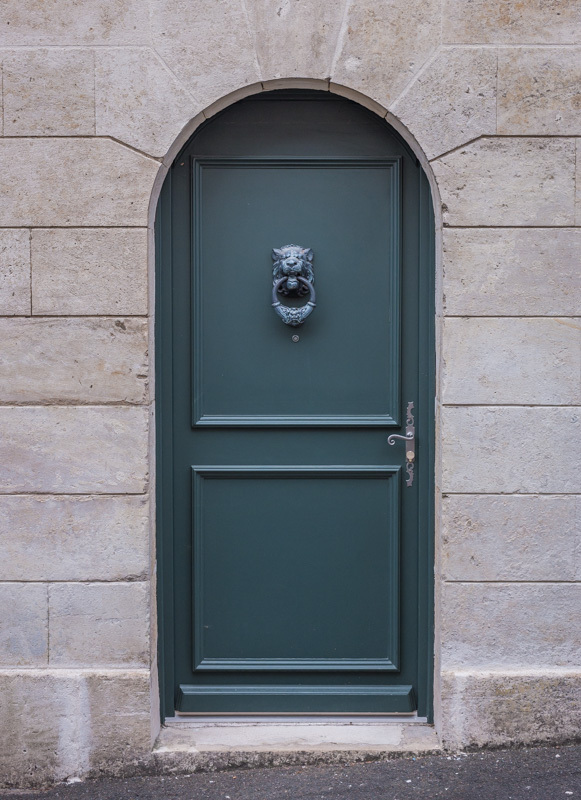 I've seen posters made up of door photos, I see doors all over the internet photo sites. I'm no exception. I take pictures of them, too. Somebody had to choose these colors. I'm not sure they work together. The wrought iron rail at the top looks to be the same lavender color as the door on the right. 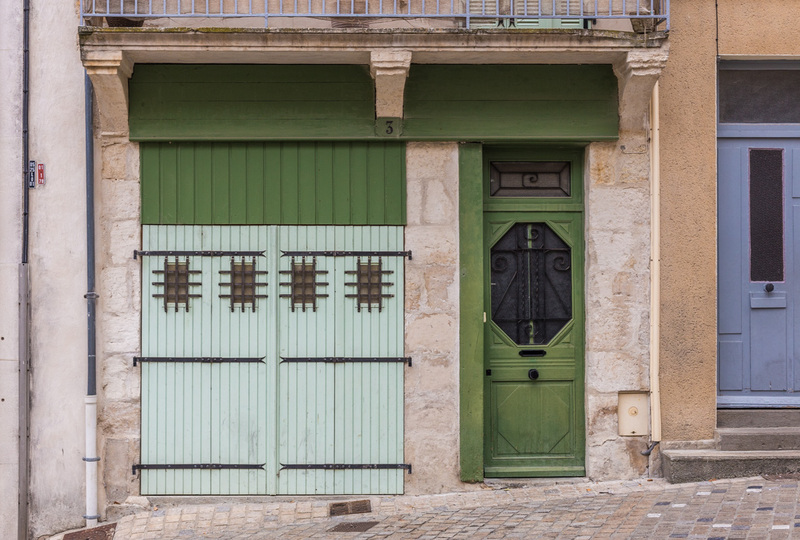 In France, door and window shutters offer an opportunity for bright colors that break the monotony of a streetscape made mostly of stone. I found these two examples fairly close to one another in the city of Niort, near the west coast of France. A close look reveals that the top corners of this door are cut at an angle to make it fit within the arch of the stone frame. The first one is a little over the top, the second one more elegantly understated, in my humble opinion. We crossed the plaza, which is more or less just a wide street that's been made pedestrian-friendly, and headed up the hill into the neighborhood on the other side. We came to the Musée du Pilori, an exposition space for contemporary artists. Le musée du Pilori at the end of the street with its medieval facade and clock tower. Notice the empty wine bottle standing on the street next to the yellow mailbox on the right. 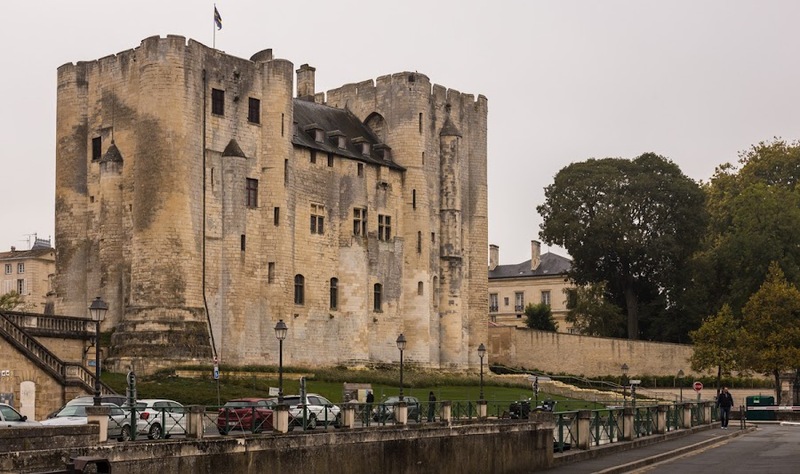 The building was Niort's city hall from the middle ages until the revolution in the 18th century. Its name comes from the pillories that occupied the site before the building was built, a place to secure and publicly display criminals. I didn't know any of this when we walked by (except for the sign on the door saying it was a museum). I've since done a little internet research about the building. 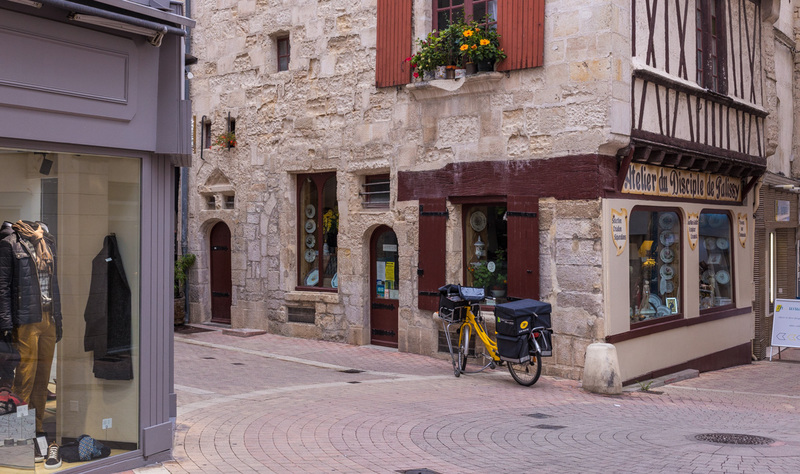 I don't have much to say about this photo, other than it shows a modern postal service bicycle parked next to a historic medieval building. The boutique in the building is a ceramics shop. There's a men's clothing shop on the left. The mannequins have lost their heads. 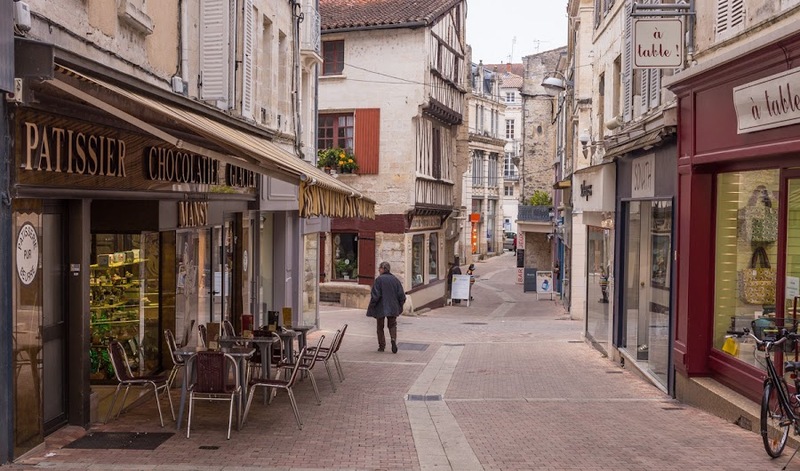 It's still the rue St.-Jean in the city of Niort, not much further along from yesterday's photo. It's very close to where the street empties into a large plaza. We crossed the plaza and headed up into the neighborhood on the other side. When we found the rue St.-Jean, we had walked up a slight incline toward city hall. The street slopes downhill, back toward the center of town, so that's the way we went. My camera says I took these photos around 10h30. Morning coffee time had passed, and it was too early for places to serve lunch. The street is calm between the morning "rush" and lunch. 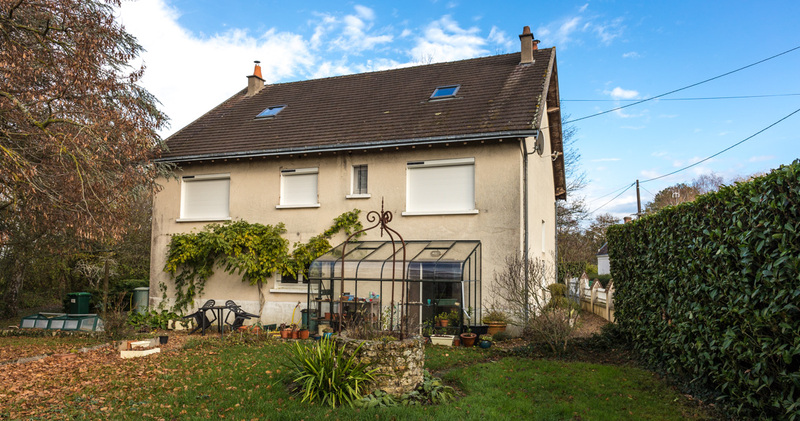 Most places in France, especially in rural areas and smaller cities, adhere to a specific schedule for mealtimes. You can't get breakfast all day, lunch isn't available until at least 12h30 and usually not past 14h00. Dinner service doesn't start until around 19h30. Some years ago, Ken found a McDonald's restaurant out in the Norman countryside that closed between lunch and dinner time. Twenty-four hour restaurants are rare. 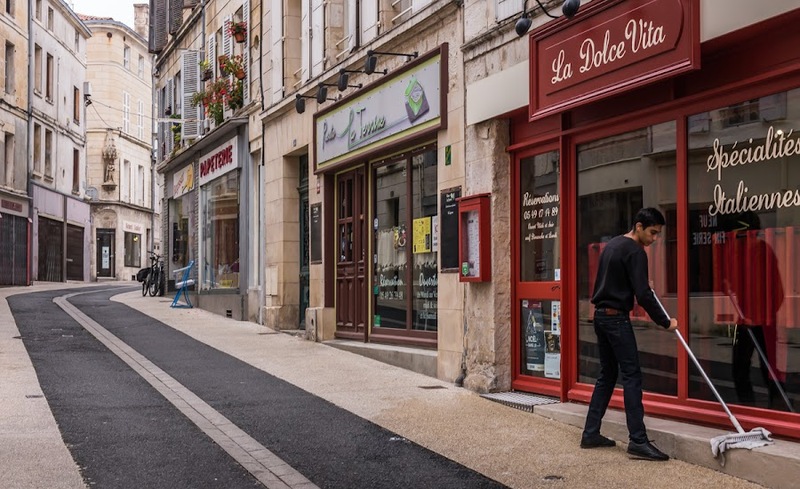 There are exceptions, of course, especially in Paris and the larger cities, where the 24/7 lifestyle is becoming more common. It's interesting to remember that for several years after we moved here, our local supermarkets closed for two hours at lunch time. Today they stay open through the day, from 08h30 or 09h00 to 19h30, but they are closed on Sunday afternoons. There are no twenty-four hour supermarkets or groceries anywhere in our region, that I'm aware of. I have a few more photos from Niort to share over the next few days. Ken had read that the rue St.-Jean was a pretty street in the city center with many historic buildings. We didn't know exactly where it was, but we found it pretty quickly. The street is lined with eateries and boutiques and merchants were open for business or, in the case of this restaurant, getting ready to open for lunch. An Italian restaurant in central Niort. Looks inviting! I think we walked almost the entire length of the street before it ended at a wide plaza. We saw a couple of department stores and more shops on the plaza, and more and more people were out and about. 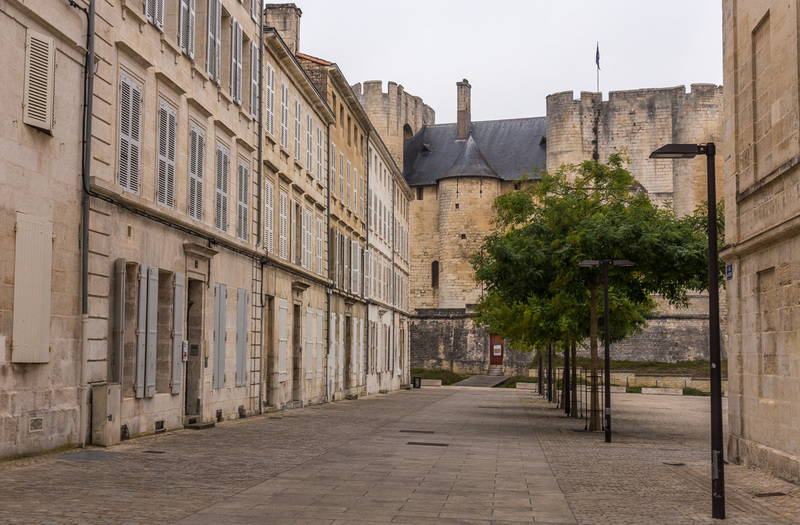 Tasha and I walked around the mostly empty Place du Donjon outside of Niort's central market hall while Ken went inside to have a look. It was relatively early on Friday morning. The bigger market days are Thursday and Saturday when the place is filled with itinerant vendors' stands and shoppers. We enjoyed being in the calm and open space this day. The place was quiet on this morning. The benches were empty. Tasha has an extendable leash that I can clip to a special belt around my waist. It leaves my hands free to take photos while giving Tasha some liberty of movement. At any time I can reel her in and lock the leash if I need to keep her close. It takes a little getting used to, but it's ok. I do many pirouettes to keep her from wrapping the leash around my legs. Looking toward the donjon. Not a soul in sight. Today is rainy, so walks will be short. There's food to be made (using the last of the leftover lamb) and tennis to be watched on tv. Thanksgiving weekend is in full swing. Ken and I had our traditional roasted leg of lamb with flageolets (beans) and glazed carrots. It was delicious, as usual. On Friday we ate leftover cold lamb and steamed potatoes with une sauce mayonnaise on the side. On Sunday we'll likely make un hachis (like a shepherd's pie) with the remaining lamb. 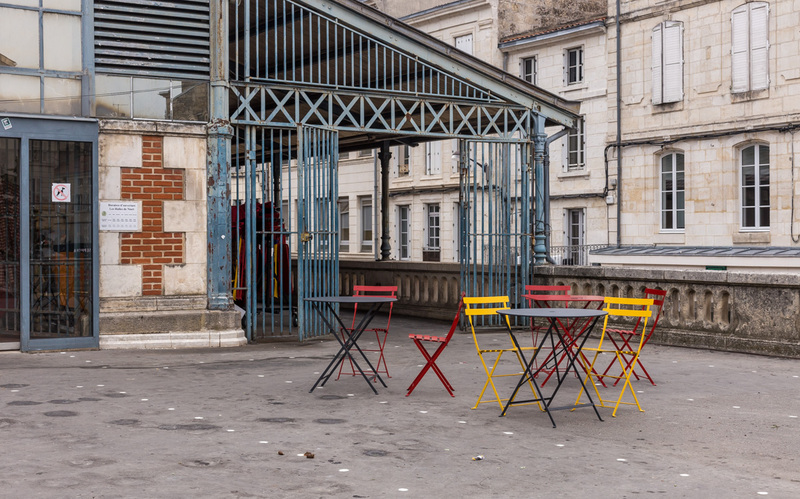 Some colorful tables and chairs outside the central market hall in Niort. Today, however, we'll take a break from the lamb and make croque-monsieur for lunch, those toasted ham and cheese sandwiches that you can find in most Paris cafés and brasseries. In other news, the weather is a little less cold, but wetter. We've had some serious foggy days, typical for November, and off-and-on rain. Sunday is expected to be very wet. We're heading toward winter. Here are the new shutters on the back, or western, side of the house. The old shutters were not working well any more. They were made of folding metal panels (finger pinchers! ), and were starting to fall apart. They were a pain to close and open because we had to open the windows to do it. That let in a lot of cold air in winter, and the sliding windows made the whole operation awkward. The new shutters are closed. The black strips on the top of each are the solar panels that generate the power to operate them. Now we have these new shutters that roll down. No more having to open the window to close or open them. Each room has a remote control and all we have to do is to push a button to make the shutters work. And they're white, so they look much more integrated with the white window frames. The old shutters, seen here in 2007, had a certain charm, but they were becoming a pain to open and close because of their age. Also, they would no longer work in the "awning" position as seen above. We're having one little problem with the middle shutter in the bathroom. It won't open all the way and just stops halfway. We called the installers and one of the guys came by on Thursday (Thanksgiving!) afternoon to have a look. He couldn't get it to work, so he said he'll try to find out how to fix it, and if he can't, replace it. He has incentive because we haven't paid them yet. So, after fifteen years, we decided to replace the old garage door. It was a manual folding door. And lately it has been more and more difficult to open and close. It was time. The new door is an automatic overhead door. Easily operated with the push of a button. Just like we always had back in the USA. 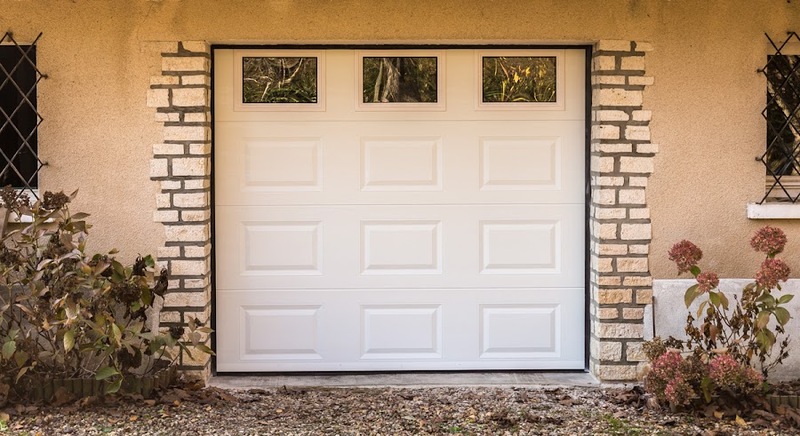 The new garage door. It's automatic and opens with a push of a button. It looks nice, and cleaner. I was worried, at first, that getting a white door would not be in keeping with how the house looked. But now I'm convinced that the white door works even better. Our house is not, after all, an old historical kind of place. It's modern, and modern improvements are not out of place. The old door had four panels that had to be opened manually, and lately they've been sticking. Now they're gone. We also have new shutters on the back (western) side of the house. I'll post about them soon. They're white as well, and they're solar powered. That means that we can push a button inside to close and open them without having to open the windows. Oh, such modernity! 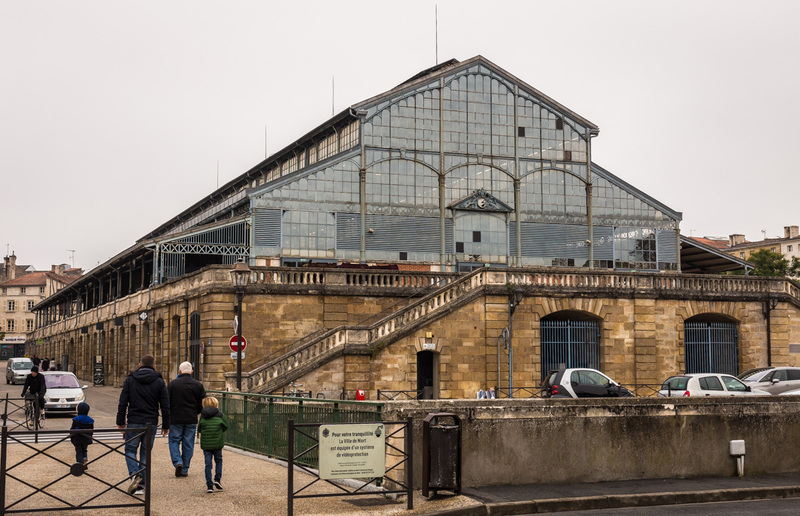 Next to the donjon in Niort is the central market hall, les halles de Niort. The current building dates from 1869 and was built in the Baltard tradition. He was the guy that designed the now defunct market halls in central Paris. Lots of iron and glass, typical of the time. Coming up from the river toward the market hall, which sits up on the Place du donjon. The market in Niort is open six days a week, but not all the stalls are open all the time. I read that Thursdays and Saturdays are the big days when most vendors are open and other merchants set up their stands on the plaza outside the market hall. We were there on a Friday. Dogs aren't allowed inside, so I stayed out with Tasha while Ken had a look. As an American and English speaker, I grew up thinking that a dungeon was a dark, underground cell where prisoners were kept and tortured. It's true that in the anglophone world, the word has evolved. 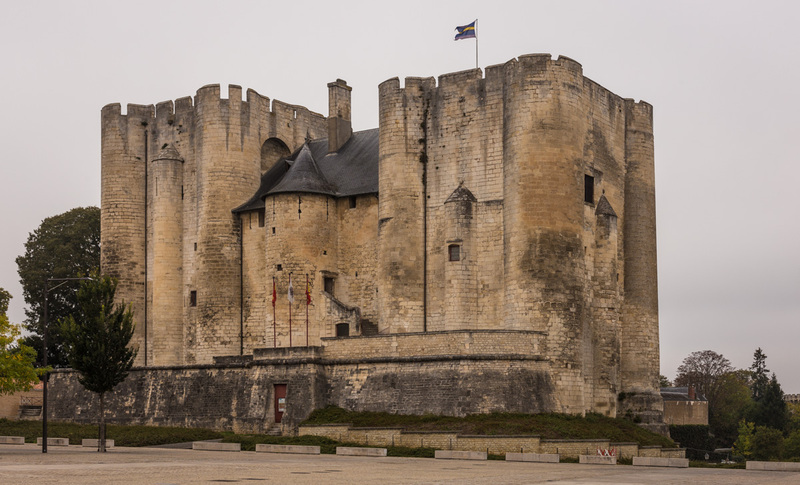 In French, un donjon is what the English call the "keep," the strong, central structure of a castle or fortress. In many medieval ruins, the donjon is often what's left standing and what we see when we visit them. The river side of the donjon, seen from the parking lot on the river. So it is with the donjon at Niort, which dates from the thirteenth century. It was part of a much larger fortress, long destroyed and dismantled, on the banks of the Sèvre Niortaise. We parked our car right across the river from the donjon, which is in the center of the old city, right next to the central market hall and not far from city hall. The city side of the old donjon. It was a museum for a while, and now it serves as an exhibition space. As usual, having the dog with us meant that we wouldn't see the interior, but that's ok. Walking around the outside was good enough. We've both been inside donjons before and I'm sure we didn't miss much. 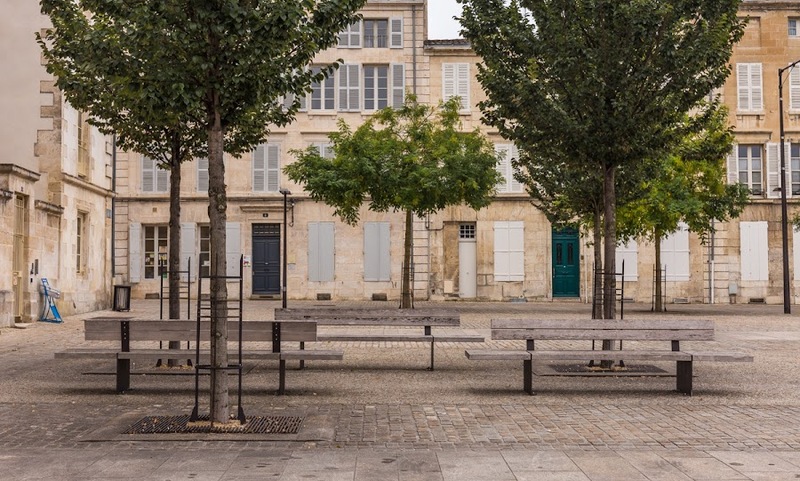 The city of Niort (pop. about 60,000) is the capital of the Deux-Sèvres department, and is just over the border from the Vendée where we stayed. Without really knowing anything about it except the name, we decided to drive over and walk around on Friday morning. 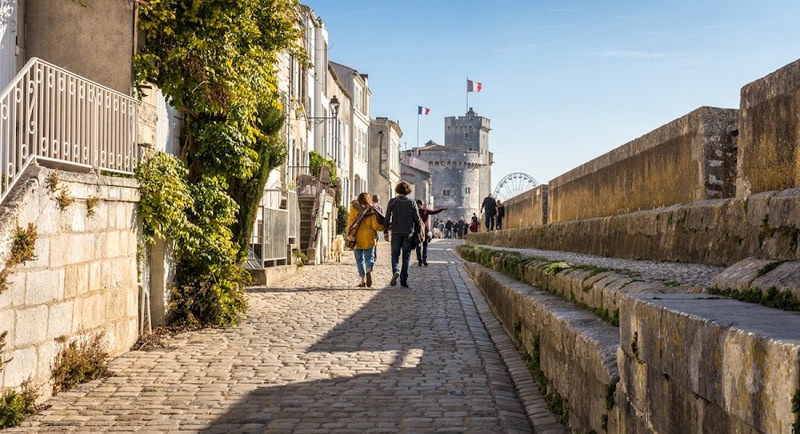 We followed the signs toward the centre-ville (downtown) and parked in a lot on a small island in the Sèvre Niortaise, the river that flows through the middle of town. 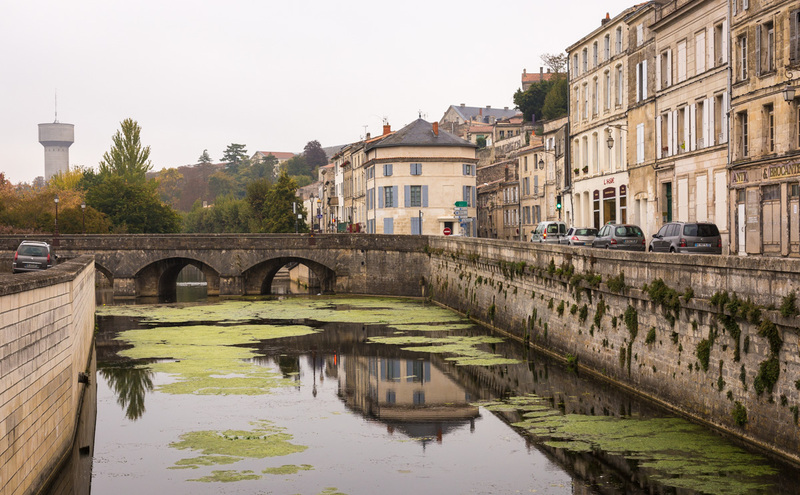 A view of the Sèvre Niortaise in the middle of Niort. As with many of the rivers in this relatively flat region, the water flowed very slowly, allowing lots of lilies and duckweed and who-knows-what-else to grow on the river's surface. The day was overcast and a little chilly, but there was no wind and walking was pleasant. I hooked Tasha's leash to my waist and we headed in. 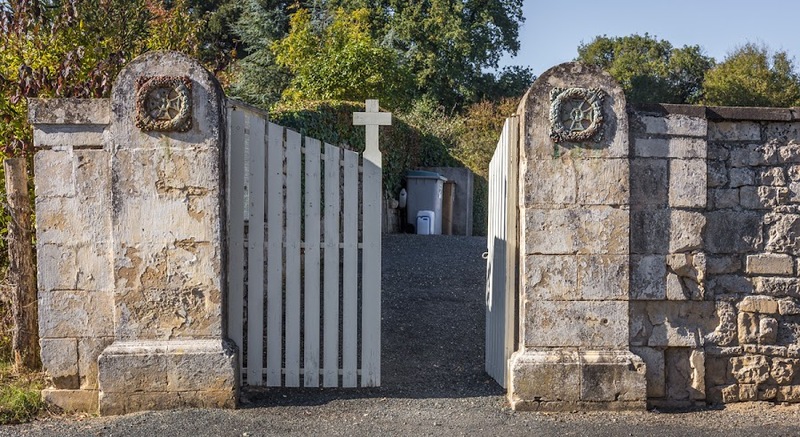 This is the entrance to a cemetery in the small town across the Vendée river from the house we rented. We took a short walk around the neighborhood and it was very quiet, except for a few people doing landscape maintenance in the cemetery. It's interesting how the cross is made from the gate's middle picket. 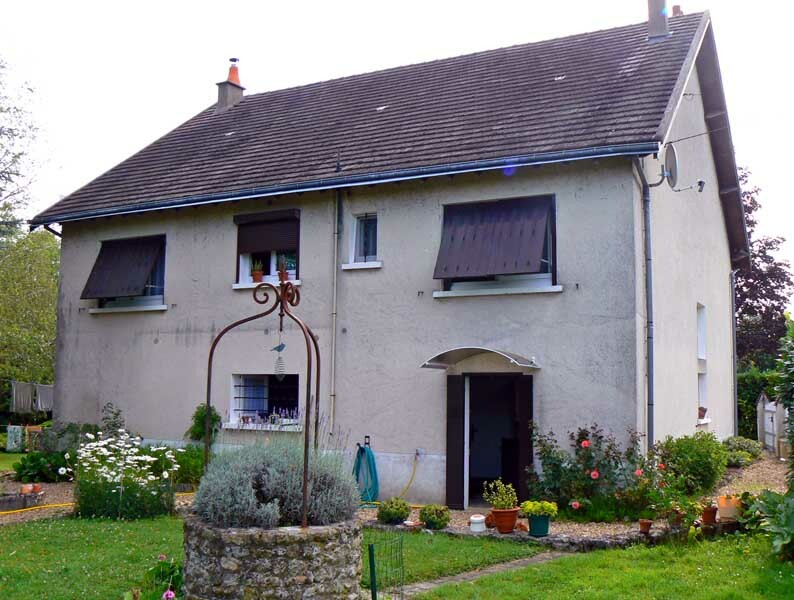 We arrived at the gîte (rental house) on a Saturday, went to La Rochelle the following Monday, and to the island of Noirmoutier on the Wednesday after that. Tuesday and Thursday we spent closer to home. 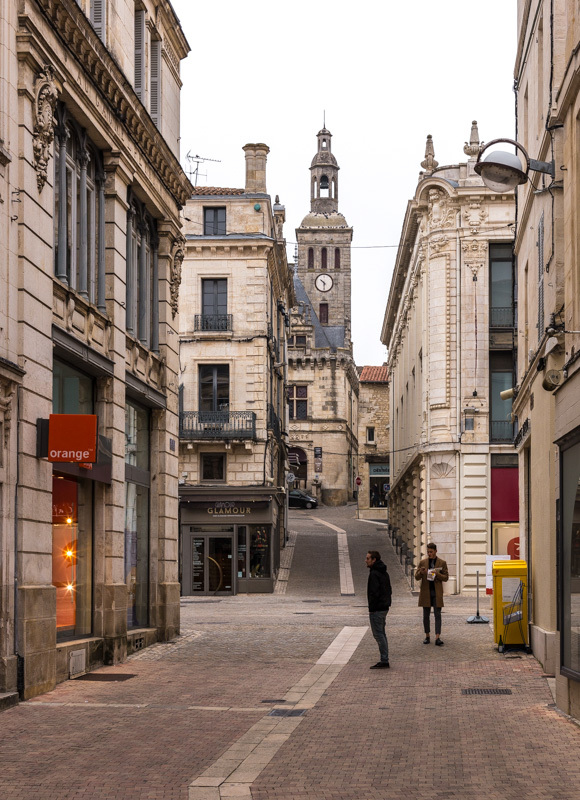 On Friday, we drove over to the city of Niort for a walk around before coming back home to Saint-Aignan on Saturday, three weeks ago now. I'll start posting my photos of Niort tomorrow. This is that beach in the video with Tasha that I posted the other day. After our little walk, we got back into the car and headed back to the mainland. We planned our return so that we would go south a little down the coast before turning back east and inland to our rental house. This took us through several rather large beach resort towns, including Saint-Jean-de-Monts, Saint-Gilles-Croix-de-Vie, and Les Sables-d'Olonne. 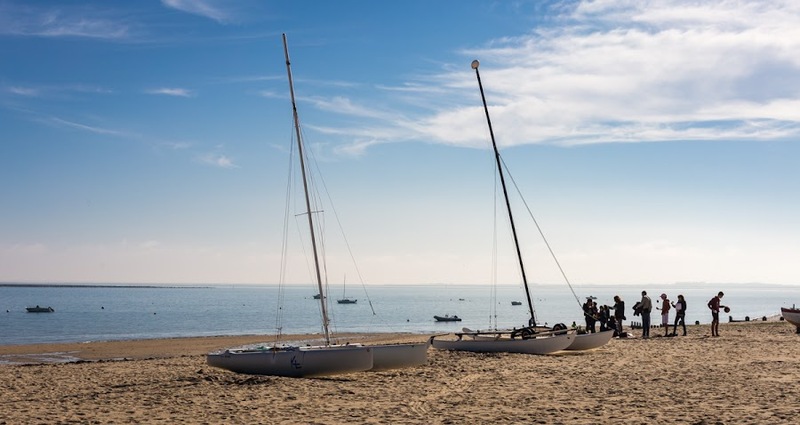 A sailboat moored off the Saint-Jean beach on Noirmoutier island. We really just passed through each one, stopping once for Ken to take a few photos. We were both impressed with the size of these places. Big wide beaches (and some surfers!) lined with wide promenades, boulevards, and mid-rise hotels and condominiums. And, since it was a week of school vacation and the weather was pretty good, they were crowded with people walking, shopping, and sitting in sidewalk cafés along the beach. 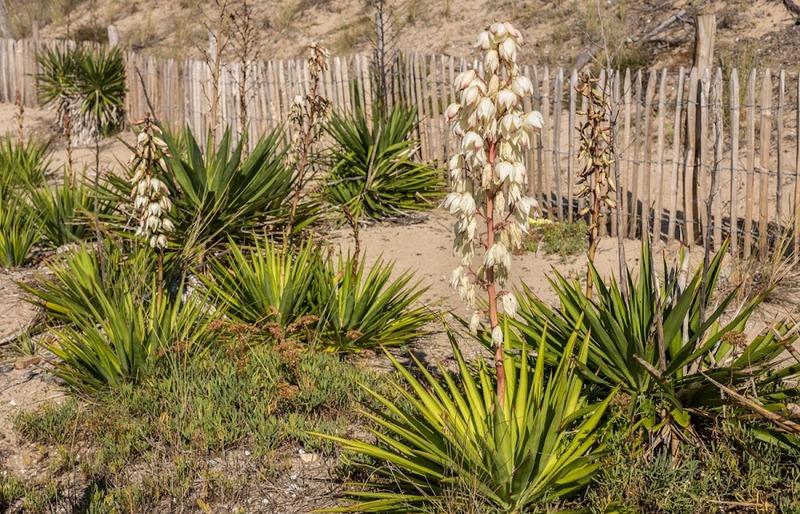 Some variety of yucca plant (I'm guessing) in bloom on the sand dune above the beach. We also got caught up in some traffic, exacerbated by road construction here and there. But none of that lasted too long, and before we knew it we were closing in on our temporary home away from home after a long and successful day trip. The Atlantic coast of France is known, at least in France, for its marais salants (salt ponds). As far as I know, these are not large commercial operations, but small artisinal businesses where salt is harvested the old-fashioned way, by hand. 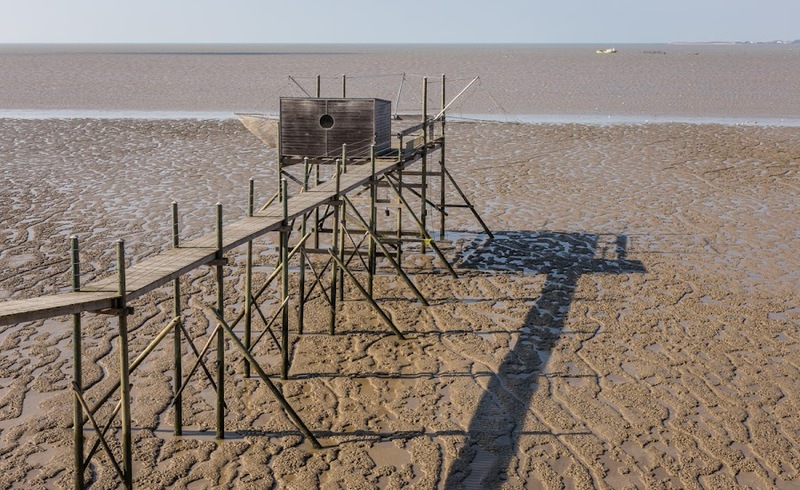 Perhaps the most famous salt product from the region is fleur de sel, the fine top-most layer of salt crystals harvested from a pond, which is now marketed as a luxury product around the world. 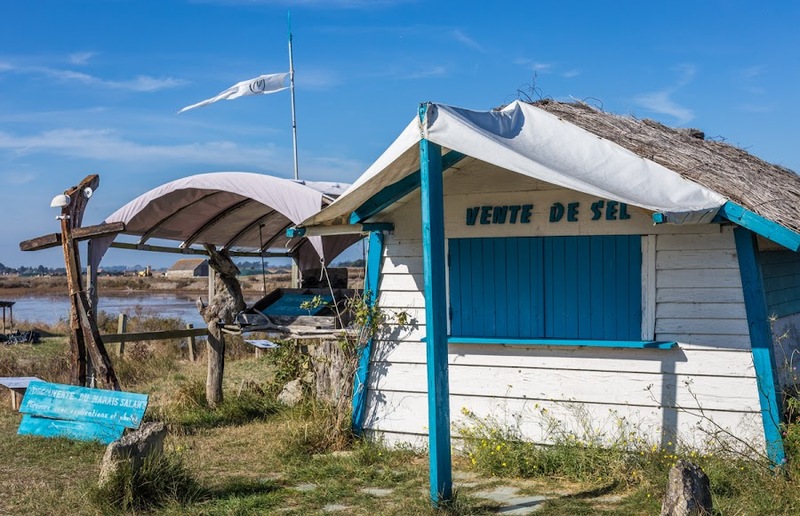 The most famous salt-producing area in the region is Guérande (north of where we were in October), and sel de Guérande is quite sought-after in France. 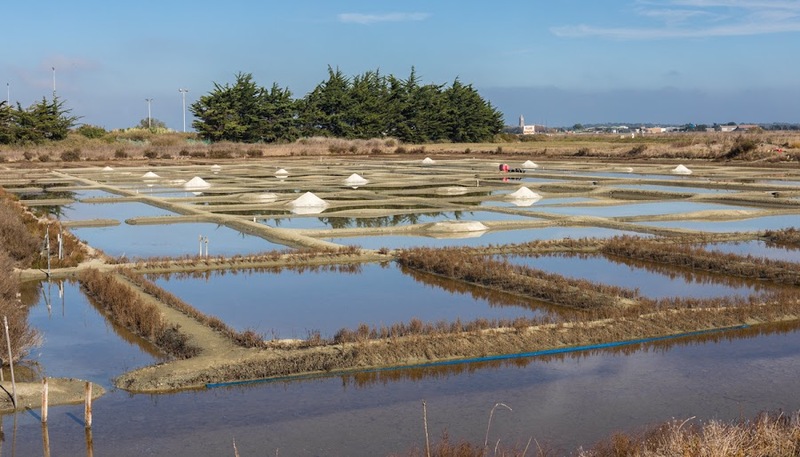 Salt ponds outside of the town of Noirmoutier-en-l'Isle (in the background). I really can't tell one batch of salt from another, so I'm not necessarily attracted to sel de Guérande nor am I willing to pay the prices for fleur de sel. But I do see stories and documentaries about artisinal salt production on television and can appreciate what goes into it and why it's important to support those who do it. There are, of course, much larger industrial salt operations on the Mediterranean coast of France, but not here. A salt shack, where salt is for sale. At this one, we saw a small trail peppered (get it?) with interpretive signs that explain salt production. Obviously, a tourist stop. So, naturally, when we drove by one of the local salt ponds on the island of Noirmoutier, I wanted to stop for photos. The stand was closed when we stopped (scheduled to open later in the afternoon), but that was better for photos. We saw the typical rectilinear evaporation ponds with their little piles of harvested salt drying in the sun. The salt is gathered by hand, using a long-handled wooden tool to scrape it from the evaporating basin into piles for drying. A couple of catamarans parked on the beach. Having grown up inland, I don't have much experience with sailing. It's not something I've done or ever wanted to do. But I can row a boat, canoe? Hehe... a little nautical humor there. I'm going out of order here. The beach in yesterday's post with Tasha was the third beach we walked on. After the first beach, on the bay side of the island, it was time for lunch. We drove around, looking for a spot that might have a picnic table or, at least, a bench we could sit on. We had packed sandwiches, chips, and a bottle of wine for a picnic. Beach cabins line the Plage des Sableaux, with the big conifer forest behind. We headed further south, still on the bay side, through a forest of conifers toward a beach called la Plage des Dames. The road dead-ended at the beach and there was not a parking spot to be found. There's a restaurant there and it was full-up with customers. So we continued driving south, through the forest. Suddenly we saw a couple of tables among the trees and one was empty, so we took it. After lunch, we continued on our way and saw that there were quite a few picnic tables further on. Lunch was tasty and satisfying and we were ready for a little more sightseeing and a short walk. 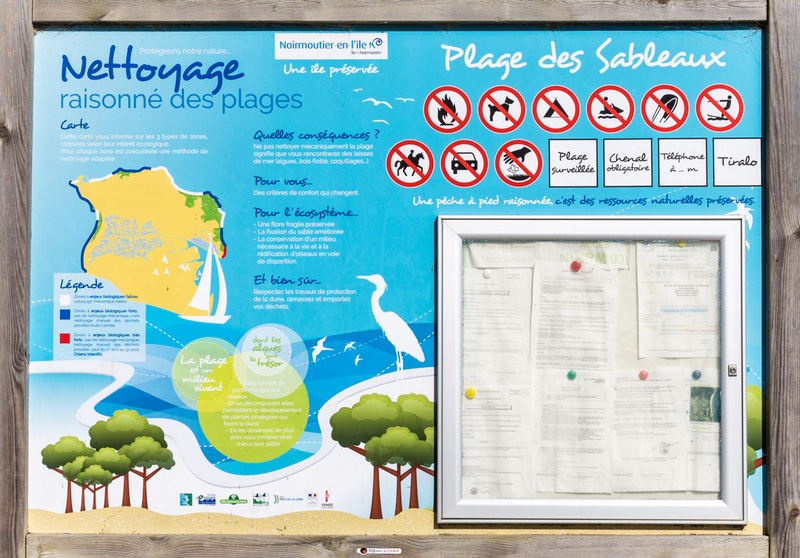 Information about how the beach is maintained in an eco-friendly manner. Oh, and no dogs allowed. We and others ignored that. At the southern end of the conifer forest, we came to la Plage des Sableaux and got out of the car to have a look. There were quite a few people doing the same thing. On the northern end of the beach stood a long row of beach cabins. I've seen these on tv documentaries about the coast and beach resorts. It was cool to see them in person. Dog day at the beach! 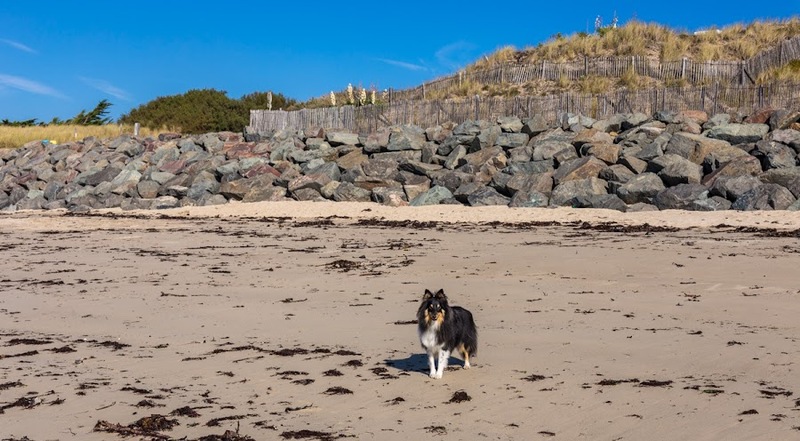 This is the second third beach we took Tasha to on Noirmoutier. It's on the ocean side of the island, so there is more sand, and dunes. She had a good time running around and smelling things. When she got thirsty, she went to the water's edge for a drink. Oops! The look on her face when she tasted sea water was priceless. She only did that once. Luckily, I had some fresh water in the car so she could get the taste out of her mouth. Tasha poses for her portrait on the beach at l'Epine, Noirmoutier. I took a short video of her running around. I don't have a lot of experience with video, so it is what it is. All the houses in Le Vieil on the island of Noirmoutier are painted white. So it's not surprising that someone would want to be sure they could find theirs. What better way than to paint the house number BIG. Or maybe it means that 4's are not permitted? We're having periods of rain and periods of sun. But the temperatures are warm. This morning's low is about 12ºC (53.6ºF). Sunday's high was close to 17ºC (62ºF). This is the traditional time for Indian summer when there is one. But I see the long-range forecast is for more seasonable (close to freezing) weather in about a week's time. We'll see. 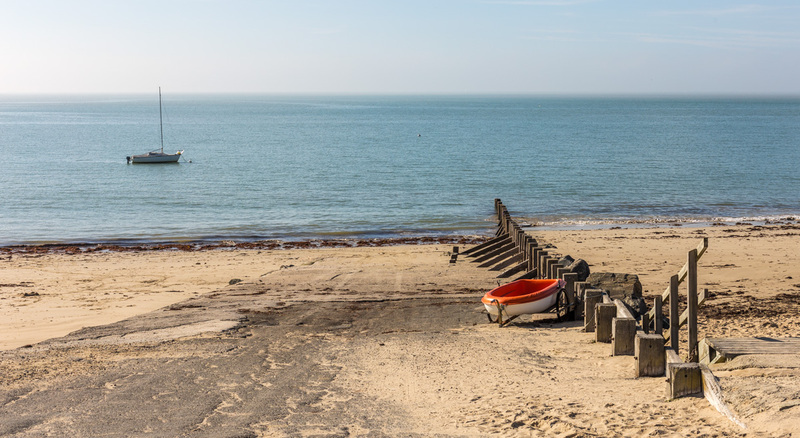 Among the places on our must-see list during our trip to the Vendée was the island of Noirmoutier. Ken and I had set foot on the island once before, in 1992. The island is connected to the mainland by a narrow causeway that is submerged during high tide, and we wanted to drive across. We did, and then immediately turned around and drove back. Looking northwest over the baie de Bourgneuf. Since the 1970s, however, a bridge connects the southern tip of the island to mainland France. So, for this trip we decided to take the bridge. On arrival, we drove the entire length of the island to its northwestern point and a fishing town called l'Herbaudière. Then we started back along the bay side to a small resort town called le Vieil, where we stopped to walk around and see the beach. Looking southeast toward the beach at La Clère. Tasha was extremely excited to be on the beach. It was her first time running in the sand and I could see the big smile on her face. Once again, we arrived near low tide. We could see people out among the rocky tide pools collecting shellfish like mussels and small clams. La pêche à pied (fishing on your feet) is very popular on the Atlantic and Channel coasts. Here's a view of the road at the Pointe St.-Clément outside of Esnandes where we saw the fishing cabins (yesterday's post). The land rises up at this spot and there's a good view out over the bay and toward the ocean. We saw a few people up at the overlook and a camper parked down by the marsh. Otherwise we were alone with the birds. Looking west out over the bay toward the Atlantic Ocean. We walked around for a few minutes and took some photos and let Tahsa run off leash a little. She had been such a good dog in La Rochelle, she deserved a little freedom. But soon we were in the car again heading back to the rental house with a stop at a supermarket for a few things. A view of the point, the marsh, and north into the bay toward the mouth of the Sèvre Niortaise River. It was a long day and a lot of car-riding, but the beautiful weather made it worth it. When we got back to the house, Ken cooked the fish he found in the market that morning for our supper. We saved the oysters for the next day. 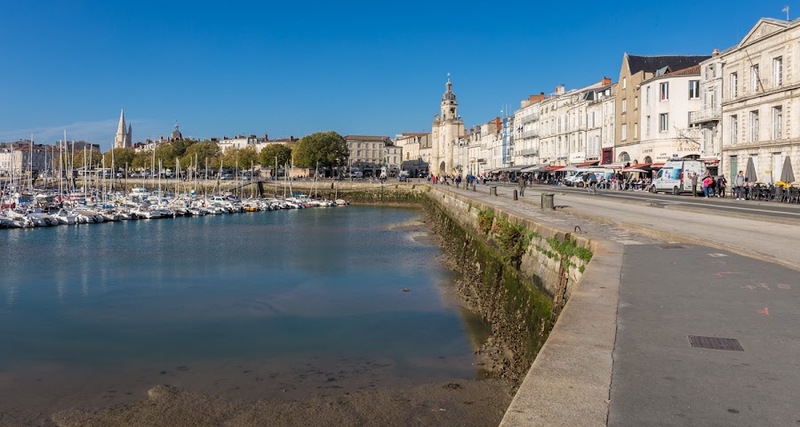 After our lunch on the port in La Rochelle, we decided to get out of Dodge and head north along the coast. I saw a place on the map, about fifteen kilometers north, where the road went right down to the water. I thought it would be nice to see the ocean and maybe walk on a beach. We saw the ocean, but the beach was mostly mud flats. Pêcheries with their big square nets poised to be lowered into the water, but not until the tide comes back in. We got off the main road toward a town called Esnandes. The road lead us through town and toward the beach. As we got closer, a cliff rose up on our left and a large marsh extended off to our right. At the waterfront, the road wound up to the top of the cliff where there was a parking lot and an view point. The mud flats were beautiful, and we saw a lot of different shore birds feeding on them. To our surprise, we could see a few pêcheries in the form of big wooden piers built out into the flats. Each had small cabin at the end and the mechanisms for lowering big square nets called carrelets into the water at high tide. I've seen these on television many times, but I think it's the first time I've seen them in person. They're pretty typical along the Atlantic coast from this point south toward Bordeaux. La Rochelle and Esnandes are not in the Vendée department where our rental house was located. This is the Charente-Maritime, but the border between the two is very close. Just a couple of random views of the old port at La Rochelle. We made our way back along the edge of the port looking for a place to eat lunch. We had scoped out a place earlier and it turned out to be where we ended up. Part of the old port seen from the base of the Tour de la chaine. We were a little early which gave us a chance to choose our table so that we'd be out of the way with the dog. 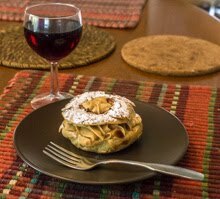 Once installed, we each had a glass of pineau des Charentes. It's a fortified wine, like sherry or vermouth, that originated in that region, made by adding cognac (brandy) to grape juice and allowing it to mature. It's relatively sweet and is served chilled. The marina and sailboats, looking east. For lunch, we each ordered a pizza reine, my favorite pizza, with ham, mushrooms, and cheese. They were a little bigger than a typical French one-person pizza, but we both finished with no leftovers. Tasha got a little crust that just happened to "fall" to the ground. No, not Minas Morgul and Orthanc. A little "Lord of the Rings" humor there. 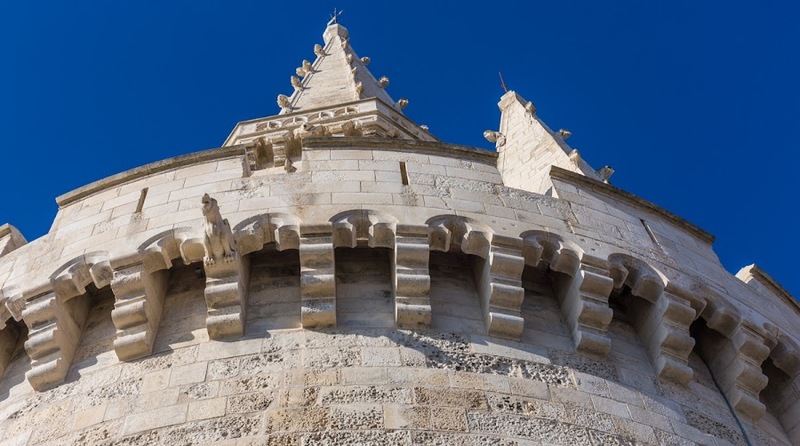 These are the towers that guard the entrance to the old port at La Rochelle. The taller one is the Tour Saint-Nicolas (Saint Nicholas Tower), the shorter is the Tour de la chaine (Chain Tower). Both were built in the 14th century. Walking along the city wall from the Lantern tower toward the Saint-Nicolas and Chain towers. The Chain Tower gets it name from the iron chain that was stretched across the entrance to the port between the two towers to keep marauders out. Portions of the chain still exist and are on display outside the tower. I managed not to get a photo of that. The two towers seen from outside the old port. Again, both towers are open to the public with historical exhibits inside, but we stayed out with Tasha. Besides, lunch time was fast approaching. I posted a photo of these two towers seen from inside the port last Sunday. I may have confused things yesterday when I wrote that the entrance to the port at La Rochelle is flanked by two towers. I showed two towers in the photo, but they aren't the ones I was referring to. I'll get back to those. This is the Tower of the Lantern, not far from the port entrance, on the ocean side and western extremity of the old city. A tower of one sort or another has stood on this site since the early thirteenth century, but the current configuration is more recent. Like the fifteenth century. The ocean's to the left, the old city is behind the wall on the right. This tower is connected to the others by a fortified rampart. We walked out on the ocean side and then back along the wall, on the city side. The interior of the tower is open to visitors, but we stayed outside since Tasha was with us. Looking up. See the gargoyle, center left? I read that the tower was renovated and cleaned a couple of years ago, explaining why the stone is such a brilliant white right now. The tower was part of the fortification of the old city and also served as a lighthouse, hence the name lanterne. We visited La Rochelle on a Monday. The day was gorgeous, weather-wise, and it was the first day of a two-week school vacation. There were a lot of people out. A lot of kids. People with dogs. Bicyclists. The main streets around the port were closed off to traffic, except for buses. It felt like summer. Looking west: the tower in the distance on the left is the Tour de la lanterne (the lantern tower), a vestige of the city's medieval fortifications. The tower on the right is the Porte de la grosse horloge (the clock tower gate) which leads into the old city. 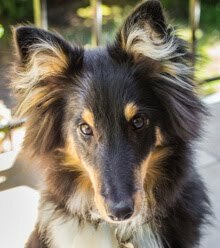 Tasha was behaving very well, and she can be forgiven for the occasional bark at a passing dog. We walked around the west side of the port down to where it connects with a channel to the ocean. There, the entrance to the port is flanked by two towers. Cafés and restaurants facing the port were bustling with people having coffee and apéritifs. It was about an hour until lunch time and we were getting hungry. But I'm getting ahead of myself. 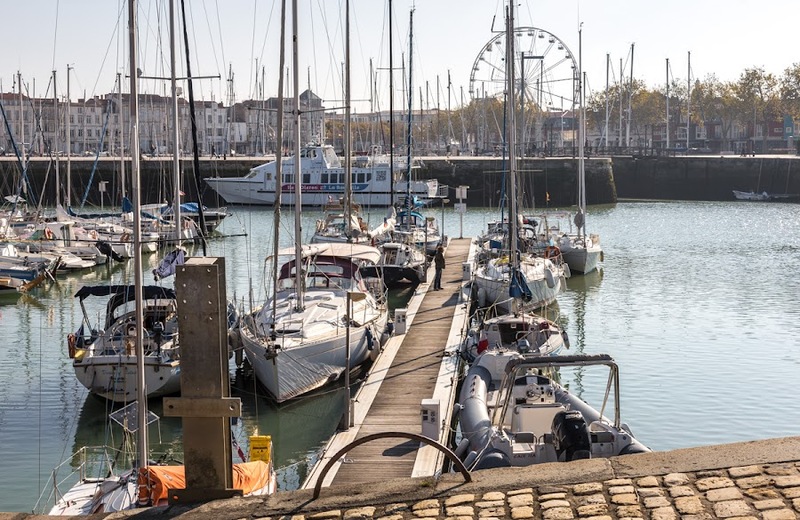 We drove about an hour to the historic port city of La Rochelle. The weather was spectacularly sunny and warm. Our first stop was at the old central market hall where we hoped to buy some fresh fish for dinner. The cooler and ice blocks were in the trunk. As we got into the center of town, the streets narrowed down considerably, as they do. 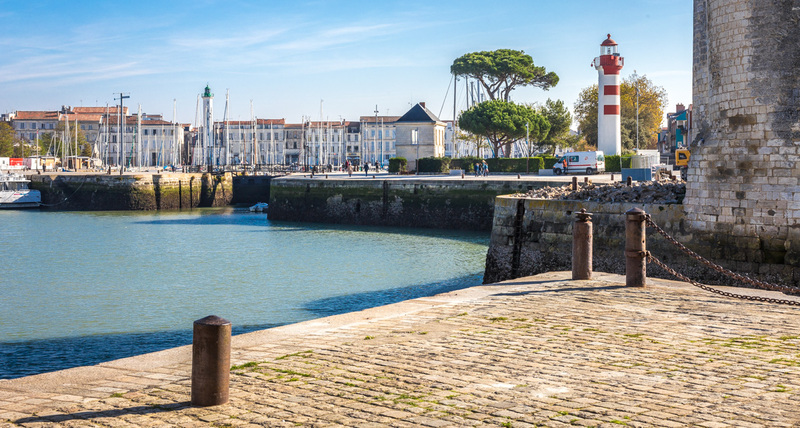 The old fishing port at La Rochelle, now home to mostly pleasure boats, ferries, and cruisers. We arrived at low tide. We found a parking spot about a block from the market. The parking meter was of a kind I hadn't seen before. It required me to type in our license plate number before paying. There was no ticket to display on the car's dashboard. The parking patrol scans the license plates on the street and their computer tells them who has paid and who has not. The dog and I wandered around the market stands outside the hall while Ken went inside to find a fish monger. Tasha was very excited to be in a place bustling with people and dogs and activity all around. Ken found a fish stand and got a couple of beautiful dorades royales (sea bream) that the vendor scaled and filleted for him. When he came out, we stopped at an oyster stand for a couple dozen oysters. Into the cooler it all went and we headed down to the waterfront for a walk around the old port. This is une mangeoire (a manger) in one of the cow pastures that Tasha and I passed while walking along the Vendée River. 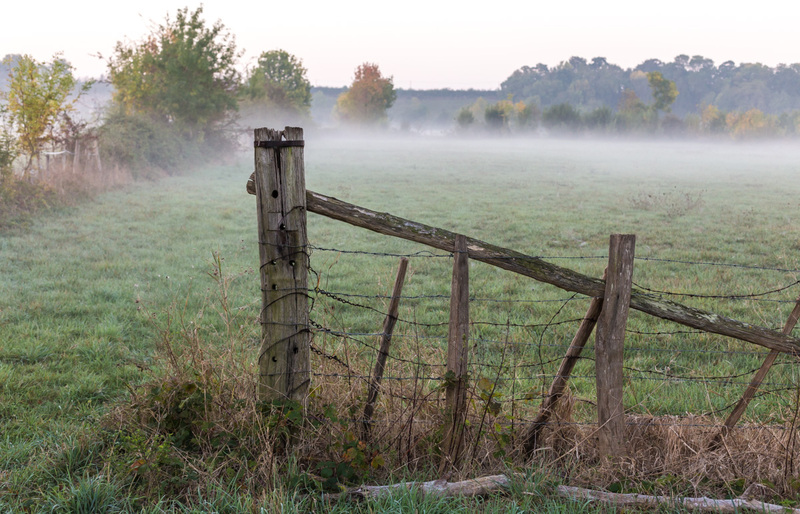 Before the sun was up, ground fog made the pasture look a little eerie. On our way back to the house, however, the sun had burned the mists away. The word manger [mon-ZHAY] is the French verb "to eat." We use it to mean "feeding trough." The French word for that is mangeoire [mon-ZHWAR]. An old word for une mangeoire is une crèche [KRESH] which, in France, has come to describe what we call a nativity scene. It's also become, since the late nineteenth century, the modern word for "child day care center." On our first morning in the rental house in the Vendée, a Sunday, I felt a slight chill in the air and noticed ground fog forming in the low lands on either side of the river. 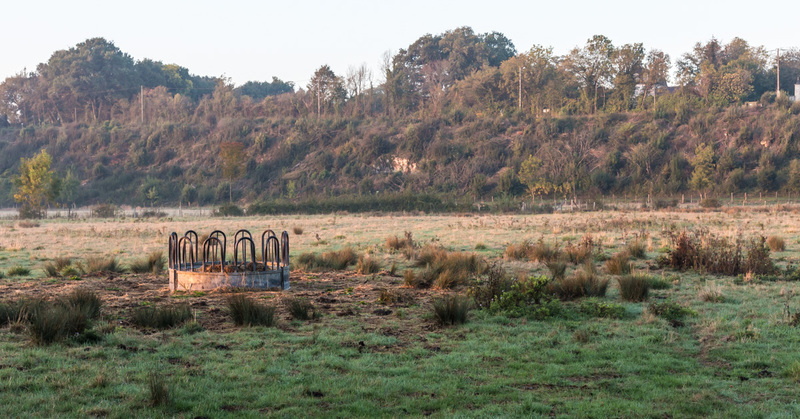 Tasha and I were out for a walk as the sun came up over the shallow valley. Mist rose from the river like steam from a hot bath. It hugged the hillsides, unable to climb much higher than my head. Barbed-wire fences marked the boundaries between pastures. We walked along the road parallel to the river. The water flowed so slowly that it was almost imperceptible. On either bank, neatly cropped pastures stood empty, the cows probably still huddled in their barns. With the exception of some birdsong and the occasional frantic flapping of a duck taking to the air, there was no sound. A rare opening in the pasture fence. We didn't go in. Tasha made her way, nose to the ground, trying to figure out the lay of the land and who, and what, had passed before us. 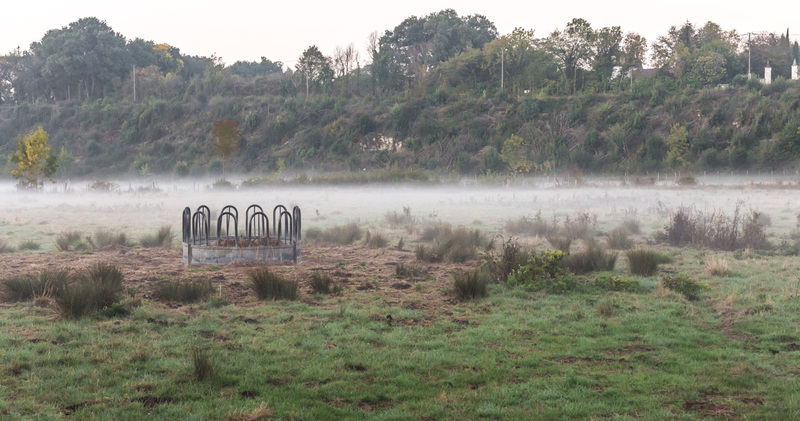 By the end of our walk, the mist had gone. 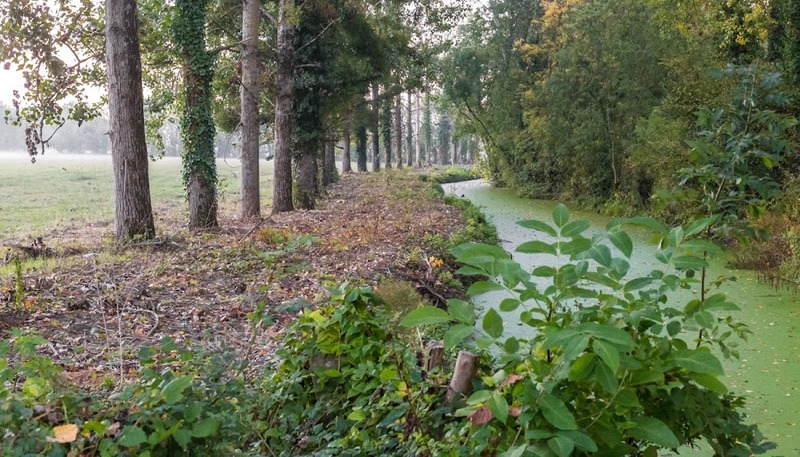 The marshland region we visited last week is formally called le Marais poitevin, but it's also known as la Venise verte (Green Venice). The channels that criss-cross the region remind people of the canals in Venice, except that they're located in a green landscape and not a city. But, more than that, the water is very slow-moving and duckweed grows and covers the water's surface in many of them. A channel that feeds the Vendée river near our rental house, covered with green duckweed. A sizeable tourist industry is built around boat rides on the canals, either renting boats to people or taking them on rides with a guide. The boats are small and flat-bottomed, and the guides stand in the back of the boat and push them with long-handled paddles, in much the same way the famed gondoliers in Venice drive the boats there.